How can nutrition help in preserving hair healthy? Nutrition determines the organism΄s deterioration speed as to its energy and structural status in a long-term basis. Hair is a structural element that needs other structural elements (proteins, minerals, trace elements) – which are obtained through nutrition – in order to grow healthily. B) vitamins, which are not produced by the organism (except for D) and must be received through nutrition. Consequently, in order to allow hair to grow normally, we should follow a balanced nutrition that includes a variety of food groups, so as to ensure i) the presence of raw material for hair synthesis and ii) the presence of vitamins in order to allow raw material to be metabolized in energy and structural elements. 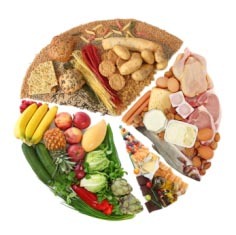 A good proportion can be: proteins 15-20% of daily food intake, carbohydrates 50-55% and fat 25-30%. In order to comprehend the essential role of a balanced nutrition, we will refer to an instance: a diet poor in proteins, obligates the organism to save energy from hair follicles by forcing them to enter the Telogen Phase, the last phase of the hair life cycle. As a result, massive hair loss can be observed in 3-4 months. This condition is reversible, provided the organism gets its daily recommended intake of protein. The role of water is also catalytic: the daily sufficient consumption of water is 1,5 – 2 lt a day. Statistics reveal that 90% of people experiencing hair loss consume less than 1,5 fruit a day, very few salads, inadequate volume of water and omit breakfast or a meal per day. The effects of malnutrition become evident in a long-term period, so we are advised to follow the dietary model that bests meets our personal needs and our organism΄s requirements.